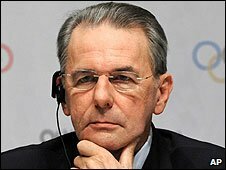 Jacques Rogge has been re-elected unopposed as president of the International Olympic Committee. Rogge will serve his final four years, which takes him through the London 2012 Olympics, before stepping down in 2013. Sir Craig Reedie also became the first Briton to be elected on to the IOC's executive board since 1961. The IOC session in Copenhagen confirmed Rogge's re-election by 88 votes to one. The Belgian, 67, had taken over in 2001 from Spaniard Juan Antonio Samaranch. He told the IOC members: "You have given me a great honour, we have accomplished a lot together." Brazil's 93-year-old IOC member Joao Havelange had asked that the vote be done simply by acclamation, but Rogge insisted on a secret ballot. Meanwhile, the IOC elected Mario Pescante of Italy and Ser Miang Ng of Singapore as new vice-presidents, rejecting two other candidates - C.K. Wu of Taiwan and Samih Moudallal of Syria - who had also applied to be vice-presidents. The Olympic body re-elected its current 106 members. Rogge, a former orthopaedic surgeon, made the fight against doping his top priority in his first eight-year term, and pledged to continue the efforts to stop cheaters over the next four years. A one-time Olympic yachtsman who also represented Belgium in rugby, he has also championed the creation of the Youth Olympic Games, which will debut in Singapore next year featuring athletes aged 14 to 18. Reedie, 67, was seeking election for a third time and beat Ireland's Patrick Hickey for a seat on the ruling board of the IOC. The former chairman of the British Olympic Association, the Scot was knighted after London's successful bid for the 2012 Games. Olympic hurdler Lord Burghley was the last Briton to win a seat on the IOC executive board.